My Heart is often folded inside of the cards I send out. So HERE is a Folded Card that has lots of love in it!! Don't You love when a neat little package has tons of dimension and surprises?? THIS Card is SURE to Surprise YOU!! 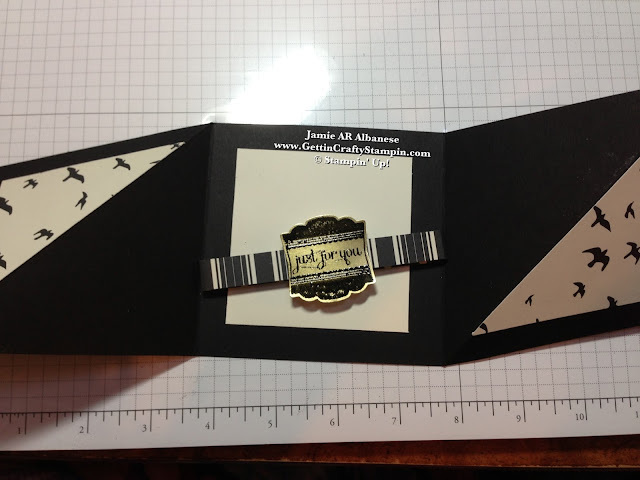 Here a 4" x 4" Black Card Stock is centered with a 3"x3" Modern Medley (#126926) piece of Flying Birds Designer Series Paper. Band this Card... It's not required but by Banding the card (this means wrapping a piece of ribbon or card stock to mimic a belt) you create Control! 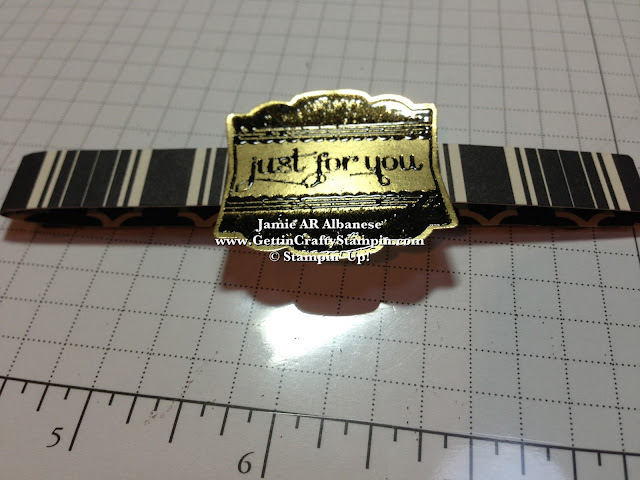 Here this striped strip mimics the Label Love stamp set's (#130622) 'Just For You' Sentiment. Mixing Patterns is so trendy and shhhh - so easy! When you have coordinating colors and patterns (like in our Designer Series Paper Collections) you can (you can look good and so easily)! Creating a Folded Card is a great way to Spin on any Greeting!! HERE a FUN and Cool Folded Card is just a couple of minutes away! I Will Post a Video (Tomorrow) on how to create this card... until then, it's a 4" x 12" card scored with our Stampin' Trimmer (#126889) at the 4" and 8" points. Score the outer lines at a matching diagonal. (See the Video). This light weight cutter has scoring and cutting blades in one track - so it's easy to create great projects and quickly!! Adding a 3"x3" square of Very Vanilla card stock (#101650) and this card now has a compact but blank surface to write on! When we were recently told that GOLD Was the "IN" metal.. I giggled - I'm a Gold Girl but there is soooo much you can do with ALL of the Metals!! In Honor of Bonnie's Suggestion that Gold was all the rage - lol - I used our Black Embossing Powder (#109133) and Heat Tool (#129053) on the new and delicious Gold Foil Sheets (Holiday Catalog #132622). WOWZAZ!! Shimmer and Shine... with the vintage look of the Label Love stamp set (#130622). When you fold it this tight package comes together for a rich look. It's NOT as complicated as it looks (like most people, eh?) and with just a little love, you can get love back in return! I LOVE that this folded card is small but makes a big impact. Easy, Trendy, Cool... it opens up to fly right into your heart. 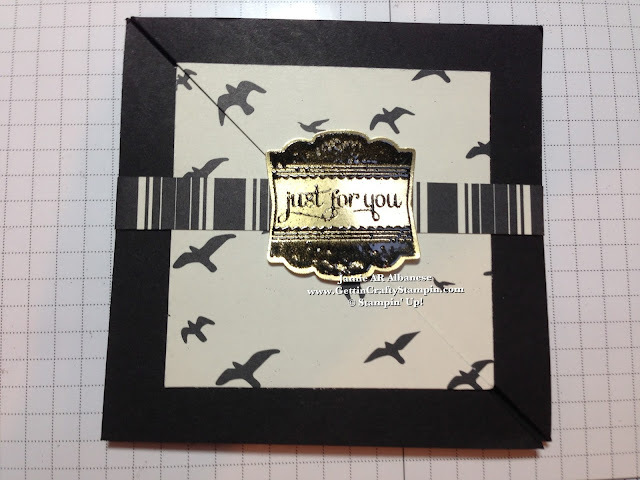 Look for my upcoming how-to video... and CLICK HERE to See the AMAZING Line of Stamps, Papers, Inks, Tools and more... and How to earn a FREE Bonus Rewards when you CLICK HERE. Leave me a Comment and let me know what you think. Pin this, Email, Facebook, Tweet, Google+ and feel free to JOIN ME on these avenues (as well as on YouTube, LinkedIn, The Vine and more!). 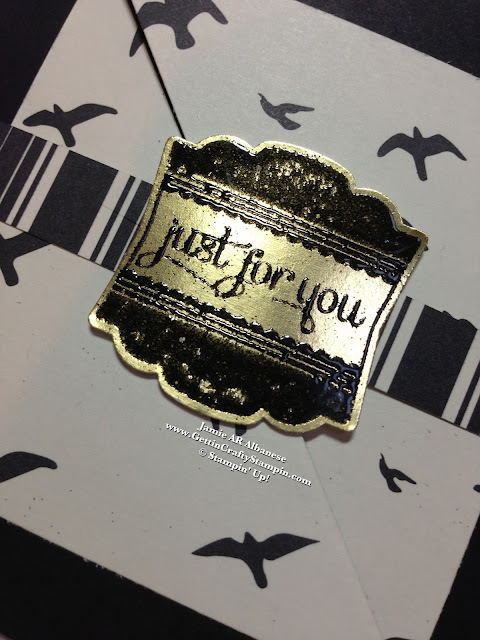 Join my Exclusive Mailing List for Bonus WOW Projects and Exclusive Gettin' Crafty Stampin' Offers!